The good father is correct. The Jews of the Old Testament are our elder brothers, not the Talmudists of today whose man-made religion is NOT the Jewish Faith of the Old Testament. Oh, my! How encouraging! 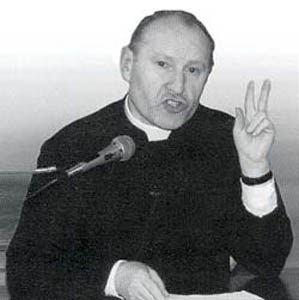 I had given up on this man, after he validated the Modernist Catholic priesthood to Lefebvre, and said nothing to support the brave souls who anathematized John XXIII and his barren successors. Perhaps he will find the light after all, though he has been pretty taciturn through the last two tumultuous years. He told the truth for once!